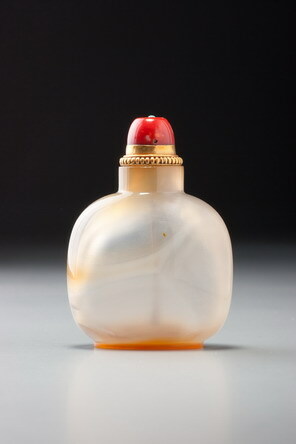 Designers in the mid- to late-nineteenth century commonly chose to ring snuff-bottle necks with simple lines or no borders at all. Here, the latter option was used. The white ground also has the slight grey cast typically associated with underglaze-red ware and the prominent bubble structure in the glaze that comes with it. The colour of the red is as fine as it gets, with a combination of reasonable control and brilliant colour. In this case, there is absolutely no doubt of the potter’s ability to exercise some control over the tones of the underglaze pigment: the boots of one figure and the shoes of the other are grey, as are specific details of the clothing of the demon-queller manifestation, which can hardly be accidental. 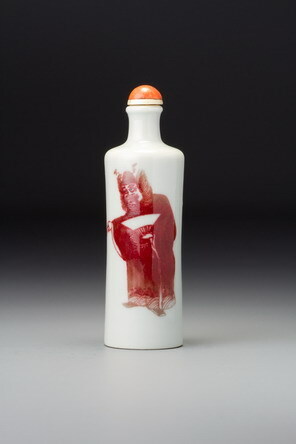 The recessed foot surrounded by a relatively broad, very flat footrim is typical of a group of these cylindrical porcelain bottles of mid- to late nineteenth century, but until we can get a better idea of how many potteries were at work to supply the popular market, and to what extent they had their own signature shapes, foot details, and so forth, it would be reckless to read too much into any single feature.